Undoubtedly, one of the most important aspects of an Everest expedition is acclimatisation to the extreme altitude found on the mountain. Mount Everest soars to a whooping 8,848m, once on the summit, climbers will experience the equivalent to 33% of the available oxygen they experience at sea level. Acclimatisation takes time, patience, hard work and a large degree of suffering. Over the past four weeks, myself and guide, Jon Gupta have completed two huge acclimatisation rotations on the mountain to get our bodies in the best possible state for our summit attempt. Our first week here was largely spent at basecamp, letting our bodies slowly adapt to the altitude of 5,100m. It was also important that we didn’t climb any higher on the mountain until after our Puja Ceremony. This Buddhist blessing ceremony is organised by our Sherpa team to bless all climbers and all of our climbing equipment for safe passage on the mountain and is of upmost importance to all Everest teams. My last Himalayan expedition was over two years ago, but during these first few days I found it very easy to slip back into expedition routine. Early nights, filling up Nalgene bottles with hot water to keep you warm during the night, not getting up in the morning until the sun hits your tent and the biggest decisions of the day being whether to drink tea or coffee. Life at basecamp is simple, straightforward and without the every day stresses experienced back home. However, after a week of this and after we had been well and truly blessed during out Puja Ceremony, we were eager to push higher on the mountain. On the North side of Everest it is easy to gain height in a relatively safe way. From basecamp 5,100m to advanced basecamp 6,400m, the route is fairly straightforward. A 22km hike over undulating glacial moraine, with very little danger. In complete contrast to the South side of the mountain where you step out of basecamp and into one of the most dangerous sections of the mountain, the Khumbu icefall. After a one-night stop at interim camp, Jon and I made it to ABC, 6,400m. Our wonderful Sherpa guides, Lhakpa and Lila had already set up our tents and were running around like they were at sea level, while I slowly crawled into the mess tent to lye down and refuel. After a couple of days acclimatising at ABC, I was itching to get my crampons on and finally begin climbing. The next section of the route is where things begin to get a little more serious. The route to the North Col. Twenty minutes out of ABC we reached crampon point, the place to don the crampons, harnesses, helmets and extra layers. From here, we cross a wide flat glacial valley towards and imposing, near vertical face and our route to the North Col. At the bottom of the face the fixed ropes begin, we clip in with our jumpers and start climbing. Each step, each pull of the jumar is painful. One step, two step, I catch my breath, one step, I catch my breath. Focus on the next anchor point, once I reach it I can have a longer rest. 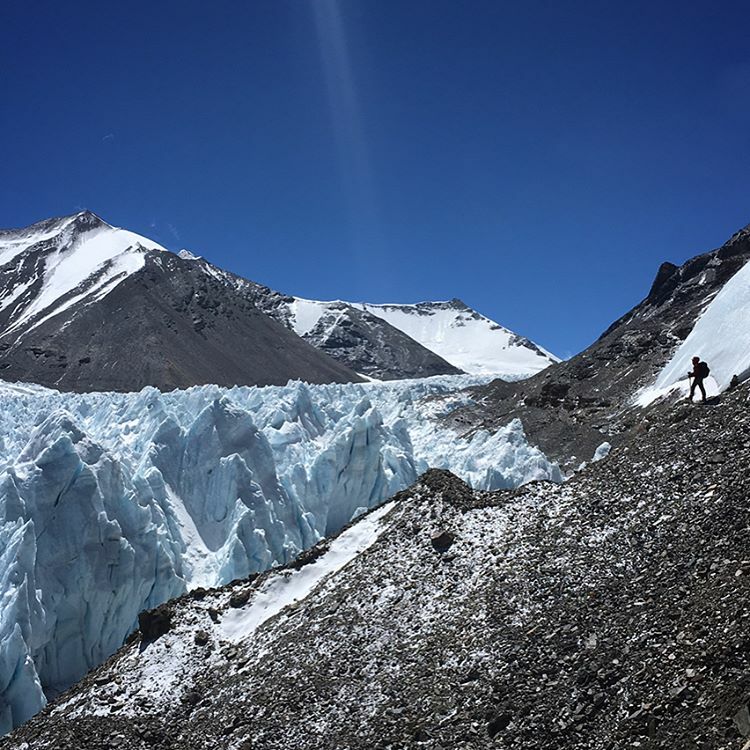 Pulling my unacclimatised body up to 7,000m was a complete struggle, every step hurt, but I knew that every step was good for me, the higher I could get, the more I would acclimatise. Jon was waiting for me on a large, flat section just over 7,000m, I pushed my exhausted body on the final few meters and collapsed down next to him. I was done, I had hit my limit for today. The funny thing about this altitude is the on the uphill it feels like you have completely emptied the tank, but as soon as you start descending, energy flows back into your legs. The five-hour uphill struggle turns into a speedy one-hour descent, quickly arm wrapping ropes back to ABC. After a night at ABC we started the long trek back to basecamp, its a long way but the reward of a shower, comfy tent and oxygen rich air made it all worth it. After three nights rest at basecamp we felt ready for our second rotation. This time we planned to sleep at the North Col for one or two nights, sleeping over 7,000m would be a great aid to our acclimatisation. We began the trek from basecamp to interim camp, after a couple of hours the weather closed in and we arrived at interim in a complete blizzard, howling winds and snow everywhere, when we finally found our tent we didn’t leave it for the next 15 hours, one long night! The next day the storm had passed and the morning was calm, sunny and beautiful. We carried on the dramatic trek to ABC, past beautiful ice sculptures all the while the perfect vista of Everest lay ahead. The second trip up to the North Col felt much easier than the first, I now knew the route and my body was more acclimatised to the altitude. We reached our tent at the North Col and began to get acquainted with our new home, sorting out our kit, melting ice for drinking water and all the while playing some 90s classics to keep us going. After a restless night over 7,000m the sun rose once again on a calm and sunny morning, it was time to get up and continue along the route. The next section of the route from the North Col to camp 2 is an incredible wide and steady snowy ridge that goes from 7,100m to about 7,900m. As we began along it, the scale was uncomprehendable. If you are imagining a ridge in Scotland, times it by about a million. It sprawled out in front of us for as far as we could see. All the while we were surrounded by the worlds highest mountains, we could see Cho Oyu, Pumori and down to Everest basecamp on the south side, it felt high, really, really high. After a few hours along this ridge we decided to head back to camp and enjoyed another night above 7,000m. I slept a lot better the second night, possibly because of all the excursion of the day! The following morning we sped back down to ABC and then back to basecamp. We were done! Well….with the acclimatisation at least, just the small matter of our summit attempt to go! Since getting back to basecamp we have been resting and letting our bodies recover. From now on in it is a waiting game. We have to wait for the Jet Stream to move from the summit of Everest and the winds die down enough for us to sneak up there and hopefully, fingers crossed, if we are lucky, have our chance to once again stand on top of the world.